The stage is set at Lucas Oil Stadium. Have a question, comment or request for Field Pass? Leave a message for Dan Potter by phone at 317.489.9385 or by e-mail at fieldpass@dci.org. 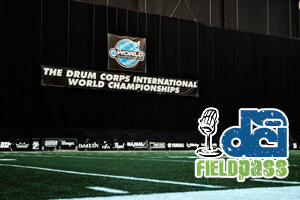 On the eve of Drum Corps International's six annual "Big, Loud & Live" cinecast of the World Championship Quarterfinals, Field Pass host Dan Potter catches up with veteran producer and director Tom Blair who this year is marking his 25th year working on DCI broadcast productions. "Big, Loud & Live 6" will be showing in nearly 400 movie theaters nationwide starting at 6:30 p.m. ET, tomorrow, Thursday, Aug. 6. Find a theater and order tickets through FathomEvents.com. Learn more about "Big, Loud & Live 6." Download and listen. (MP3, 11:38, 10.6 MB) Subscribe to this podcast through iTunes. RSS feed. Field Pass archive.